Create a minimalist, chic look for your home with this stationary sofa. The piece consists of understated design accents like tall track arms, square wood block feet, and squared cushions with welt cord trim. The loose seat and attached back cushions were both constructed using our multi-layer reflex cushions, ensuring that everyone will have a soft and resilient seat comfort that will last throughout years of use. The 702 Contemorary Sofa with 2 Accent Pillows by Sunset Home at Walker's Furniture in the Spokane, Kennewick, Tri-Cities, Wenatchee, Coeur D’Alene, Yakima, Walla Walla, Umatilla, Moses Lake area. Product availability may vary. Contact us for the most current availability on this product. Perfect for homes with more minimalist appeal, the 702 upholstery collection uses contemporary style and design. Track arms and tapered block feet offer each piece a simple look, while thick cushions will surround you in comfort as you spend time with family. 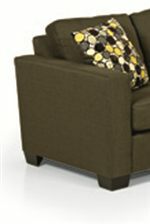 Heavy-gauge sinuous springs provide a soft and supportive seating base. With many fabric options to choose from you'll be able to find one that works with your home's current decor. The 702 collection is a great option if you are looking for Contemporary furniture in the Spokane, Kennewick, Tri-Cities, Wenatchee, Coeur D’Alene, Yakima, Walla Walla, Umatilla, Moses Lake area.